Can I access the library after graduate from Hong Kong Shue Yan University? Can I use Interlibrary Loan Service? Where can I find more information about the Interlibrary Loan Service? How can I cancel my request online? How can I place hold on an item? How can I renew items online? What other matters should I pay special attention to? How many items can I borrow? If overdue, how much fines will be charged? How to change my mailbox from receiving library notices? What is PIN? How to create my PIN? 1. Can I access the library after graduate from Hong Kong Shue Yan University? 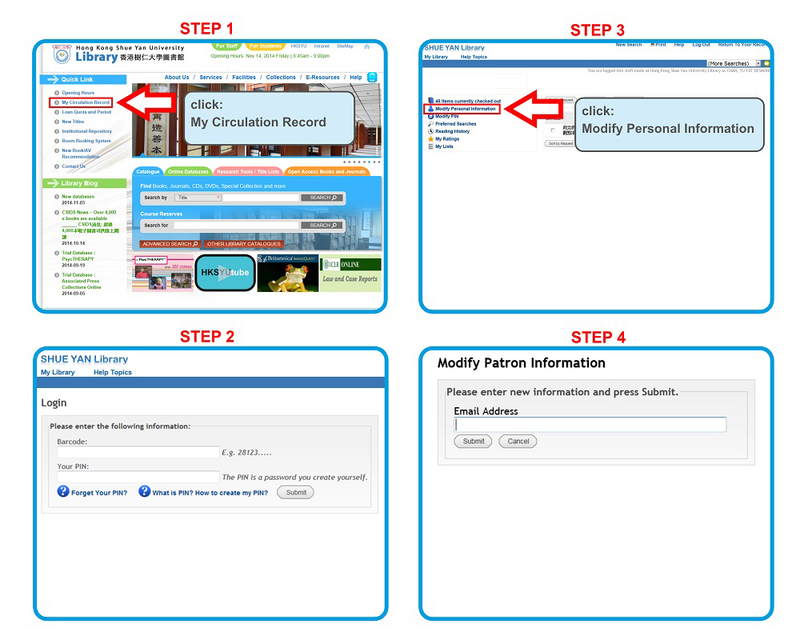 Yes, please refer to the application of HKSYU Library Cards in the Library Services page. 2. Can I use Interlibrary Loan Service? Where can I find more information about the Interlibrary Loan Service? Interlibrary Loan Service is now available in library. For details, please visit here. 3. How can I cancel my request online? 4. How can I place hold on an item? Ans: Please refer to the user manuals (online reservation) and note that not all library items are holdable. 5. How can I renew items online? What other matters should I pay special attention to? Ans: The process of renewing items online is quite simple. Please have a look at our user manual. However, please be noticed that not all items are renewable. Click here to find out what items you are able to renew. If someone already placed a hold on your borrowed item, then you will not be able to renew it. Therefore, after renewing the items, please double check the due date to confirm that your renewal are really successful. 6. How many items can I borrow? If overdue, how much fines will be charged? 7. How to change my mailbox from receiving library notices? 8. What is PIN? How to create my PIN? A PIN (Personal Identification Number) is a personal password for additional privacy protection, which is created by yourself at your first-time login to My Circulation Records. The default PIN is empty. That means, at your first-time login, you do not need to type anything in the "YOUR PIN:" textbox, just leave it blank. You only need to type your barcode and click the submit button. Then you will be asked to create your new PIN. After typing your new PIN, you have to type it again to confirm it. After the above steps, you will be able to login "My Circulation Records". Your new PIN will be effective accordingly. Please press "Forget YOUR PIN" to reset your PIN. An email will be sent to the email address in your library record. If you can't receive the email or you aren't sure what your email address is, you can bring your student/staff card and go to the Information Counter at 2/F or 3/F of the Library to seek for assistance.